Toronto, March 28: Anti-Junta parties in Thailand, led by former Prime Minister Thaksin Shinawatra’s Pheu Thai party have formed an alliance and announced that they have the requisite number of seats to form the next government. 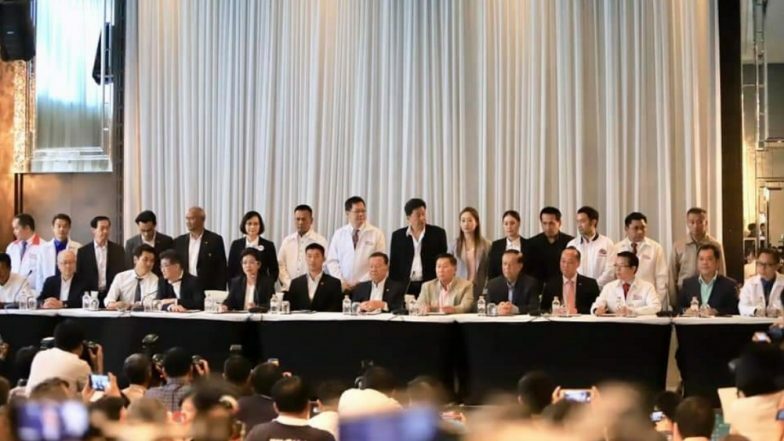 The leader of the Pheu Thai party, along with the leaders of five other parties announced their alliance at a joint news conference. They said that based on preliminary results they had won more than 250 seats in the 500-seat lower house. “Today, we hold the fact that parties on the side of democracy have received majority support from the people, although figures are not stable yet,” Pheu Thai’s Sudarat Keyuraphan said. The official results are yet to be declared by Thailand’s Election Commission. The commission has now said it will release its final preliminary results on Friday. The early results show that Pheu Thai party has won the most number of seats but that junta party led by current premiere General Prayuth Chan-ocha has won the most number of votes. Chan-ocha’s party denounced Pheu Thai’s claim to say, “How many votes each party has is based on their own understanding, not official results,” he said. The EC is also having to deal with claims of incorrect counting as well as irregular voting in some places. Such claims have meant that the EC has delayed the announcement of the official preliminary results. Thailand’s military assumed power in a coup in 2014. This is the first general election in Thailand since the junta came to power. List of Elections in 2019: What Will General Elections Across the World Bring Us This Year?